Modern astronomical measurements often require complicated methods and sophisticated equipment, like radars and spacecrafts. So I cannot help but admire those early astronomers who managed to measure things in space (with any accuracy at all) using nothing but simple geometry, primitive instruments and a basic understanding of the order of things in the nearby Universe. For example, It is one thing to measure the circumference of the Earth using a fancy geo satellite. But quite a different thing if you can do it with two sticks and ruler. The Greek astronomer and mathematician Eratosthenes was the first to measure the size of the Earth in 240 BC. The tilt on the Earth’s axis is about 23.5 degrees. That’s why the the latitudes 23.5 degrees North (Tropic of Cancer) and South (Tropic of Capricorn) of the Earth’s Equator are pretty special! 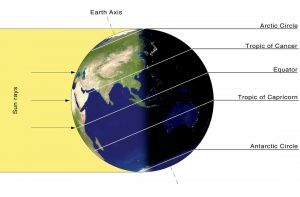 On each of the Tropics the Sun will be directly overhead at noon once a year: on Summer Solstice (Tropic of Cancer) and on Winter Solstice (Tropic of Capricorn). Remember, that if the Sun is directly overhead, it hits the ground vertically. Therefore the objects cast no shadows! Inside the Tropical Belt the Sun will be directly overhead twice a year. Outside the Tropical Belt the Sun will never be directly overhead. He learned that once a year, on the day of the Summer Solstice, at noon, the Sun was directly overhead in the city of Syene (which was almost on the latitude of the Tropic of Cancer). So on that day he stuck a pole in the ground in a different city, Alexandria, and measured the length of the stick’s shadow! (Alexandria is situated at a latitude of 31 degrees and the Sun is never directly overhead there). It allowed him to figure out an angle at which the Sun hit the ground in Alexandria. 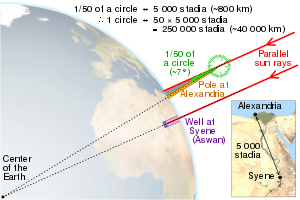 Next Eratosthenes measured the distance between the two cities. Aimed with all those numbers he finally calculated the circumference of the Earth: 250 000 stadia. How accurate his estimation was is hard to tell, as scientists disagree on the value of one stade. Depending on the actual length of the stade he used, the error of Eratosthenes’s measurements might have been 1%-15%. Much later, in 1676, the Dutch Astronomer Roemer made another famous measurement (a personal favourite of mine!). In fact, he designed his experiment for a different purpose. The groundbraking discovery was hiding in the experimental errors. It required the genius of a scientist to recognize the physics behind those numbers. I bet some of you already know what I am talking about! Planet Jupiter has 69 Moons. The four biggest moons (also called Galilean moons), Io, Europa, Ganymede and Callisto, are really big and easy to observe. Galileo was the first to find them with his primitive telescope back in 1610. And you can easily spot the four moons using no more than a pair of binoculars. With a good telescope, 3mm and more, you can see not only many Jupiter’s features, but also its biggest moons “dance”: their transits (when they pass in front of Jupiter), occultations (when they pass behind Jupiter) and eclipses. Jupiter, its big moons and their eclipses were scrupulously observed in the 17th century for the purpose of navigation. 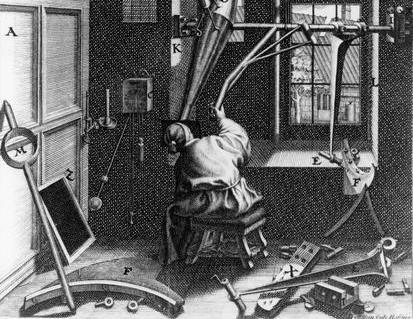 Ole Roemer was in charge of improving the tables of eclipses of the moons made by Galileo. As Roemer watched Io, the closest to Jupiter moon, he noticed something strange. The times between the eclipses of Io were not evenly spaced, as one would naturally expect. Instead, the time between the eclipses was shorter, when the Earth and Jupiter were closer to one another, and longer, when the Earth and Jupiter were further away, with the maximum delay reaching 22 minutes. After observing the phenomenon over and over again, Roemer concluded, that this was not an observational error. He suggested, that the effect was due to the light taking an additional time to travel the distance equal to the diameter of the Earth’s orbit. To fully appreciate the result, we must remember that before Roemer scientists thought that light travels instantaneously. Using Roemer’s 22 minutes value, Astronomers estimated the speed of light as 217 000 km/ sec. The modern value is about 300 000 km/sec. Interestingly, the above measurements themselves became measures of length in space. Astronomers often estimate the size of planets (especially exoplanets) in Earth Radii. The light is the fastest thing in the Universe. The distance that the light travels in one year, or Light Year, is a measure of space distances. 1 light year is equal to 9 500 000 000 000 kilometers. Want to know more? The History and Practice of Ancient Astronomy is a great book about History of Astronomy, early measurements, instruments and methods. Or why not visit our mobile planetarium if you are curious about space in general!